All good things must come to a end. This week’s blog is dedicated to three garden volunteers that have gone above and beyond to help our garden grow: Geri Shaw, Barry Einck and Emily Bauer. We asked them share a few thoughts about their TMA Garden experience. How long have you been involved with the garden? I began working with the garden prior to the first big work day. The first garden work day took place in October 2008 and my entire family spent the day working with other TMA families to lay the groundwork for what has become a beautiful, bountiful garden and learning center. What made you decide to get involved with the garden? I have always spent a lot of time in my home garden, it’s where I relax. My boys and I have always had a vegetable garden and a variety of fruit trees at home. So when a request went out for help in the garden, I immediately took note. When I saw the group needed someone with a communications background, I realized I could use my skills to communicate the mission, activities and accomplishments taking place in the garden. 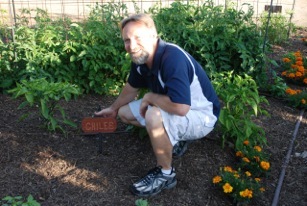 During the first few years of the garden, I mostly worked with communicating the mission and goals of the garden to the families and community by writing newsletters and preparing event announcements. I also assisted in developing a few sponsorships with local companies, worked on a grant, helped plan workdays and of course, worked in the garden. What hopes do you have for the garden once your child and you are gone? My hope is that the garden will always be a part of the TMA landscape and learning process. We should all be incredibly proud of what we have accomplished for our students, staff, TMA families and the community. We have met our goals of exposing our kids to nature and healthy foods, participating in giving back to the community and inspiring them to learn in new and different ways. For kids (and adults) who haven’t spent some time getting a little dirty and experiencing the wonder of watching a plant grow from seed to produce, the garden is a treat for the senses! Laurie and I have been involved with the garden since Clayton was in second grade, which is near the beginning of the garden project. Both Laurie and I like to work in our own garden and thought it would be nice to see TMA students learning about fresh vegetables and how they grow. Besides we thought we might learn a few things along the way! Most of my involvement has been during garden workdays and a few maintenance projects. I hope it continues to grow and evolve into a big part of future TMA students’ experiences and memories. I’ve been involved since the garden started in 2008. What type of involvement have you had in the garden? I wrote and submitted grants to earn funding for the garden. 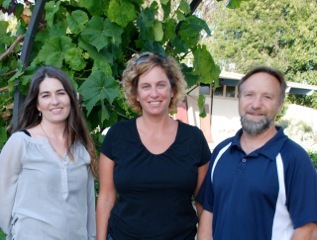 Through the grant writing process, we were selected for grant awards from Tustin Public Schools Foundation ($1,000 award), Western Growers ($1,500) and most recently Whole Foods ($2,000). I also assisted in generating the seed money needed to get the garden’s programs off the ground.